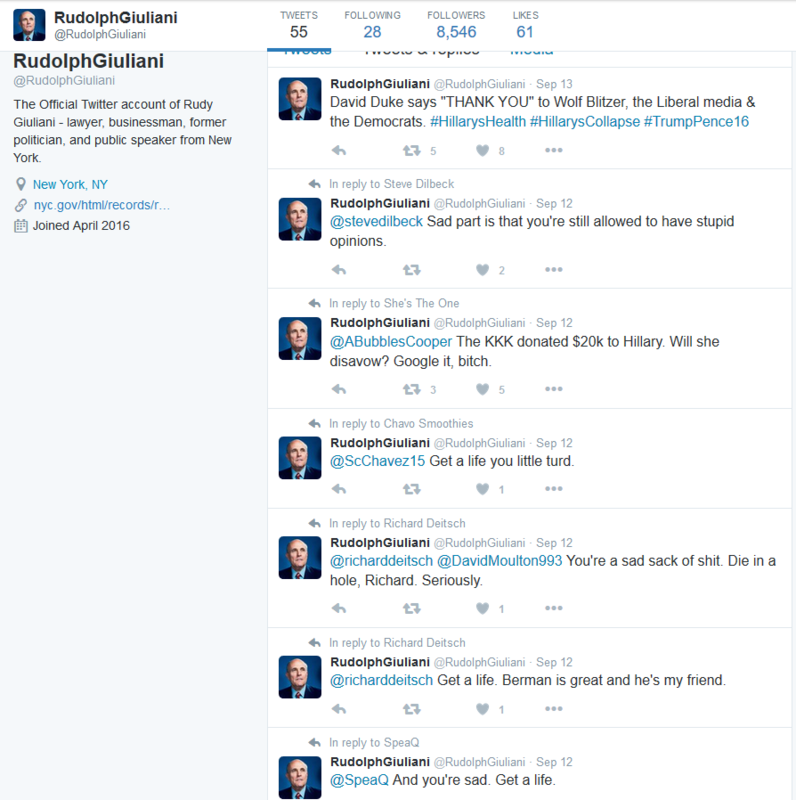 (Stillness in the Storm Editor) Rudolph Giuliani, the former mayor of New York City allegedly tweeted about Pizzagate recently—but is this true? I had several people send me the data asking me if it was real, hoping that it was. But the account was suspended due to impersonation violations. 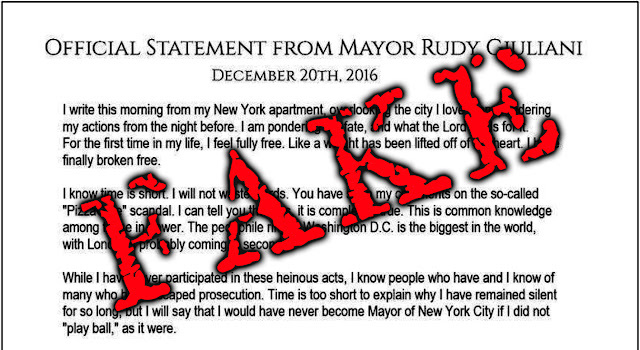 In other words, it appears that the account—and everything that it said—was a hoax and not from Giuliani. Given the fact that Pizzagate seems to be a psychological warfare operation to destroy the alternative media—despite the fact it is not completely contrived—it is possible that this was part of an attempt to bait media outlets into reporting the tweets as real. Several alt-media organizations have indeed done so, which further underscores the need for reporters of all types to be as objective as possible. While there is enough about the Pizzagate story to draw many suppositions that pedophilia and wrongdoing are taking place, there is nothing yet available that unequivocally proves anyone committed a crime. This makes it a perfect honey trap for investigators and the public, leading them to believe the narrative over and above the proper due diligence that is required. In our zeal to seek the truth, we mustn't overextend ourselves when evidence is lacking, no matter how much the story seems to be true. Of course, we've all made mistakes in discernment from time to time. The key is to learn from them and move forward with wisdom. (Aaron Kesel) The Twitter account “@RudolphGiuliani” was suspended after posting a series of Tweets, including an “official statement,” about “PizzaGate.” The Internet was quick to question why the former mayor of New York City would speak out on the subject in such a way. The only problem is… the account is fake. 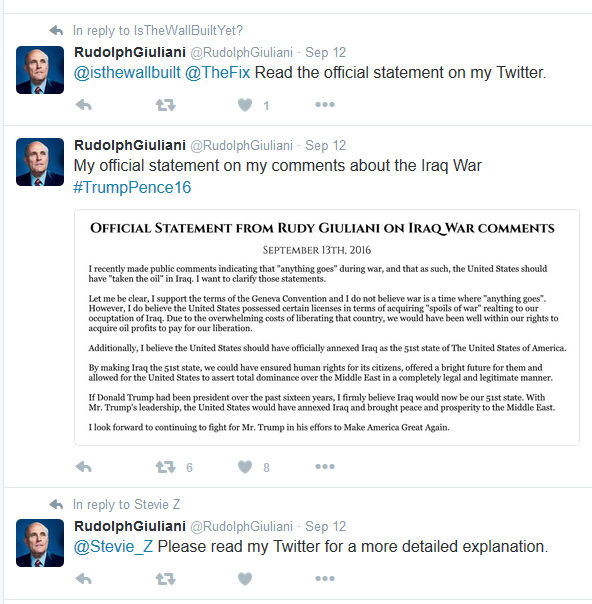 In October, Giuliani told Chuck Todd on Meet The Press that he was aware of at least four different accounts using his name, when he was questioned about a tweet from the account “@rudygiulianiGOP” critiquing Donald Trump‘s debate performance. “I didn’t tweet that. That’s not my tweet. I never said that. That’s somebody pretending to be me. There are about four of them out there that pretend to be me,” Giuliani said. Shortly before the imposter @RudolphGiuliani account was suspended on Tuesday, the user—which was not verified—posted an image purporting to be an “official statement” from Giuliani about topics such as “PizzaGate” and 911. While it is true that you should not trust what you see anymore thanks to technology like “Face2Face” and avatar-like holograms demonstrated during the 2008 election in the video below, that does not change the fact that this account is not legitimate. If you look through the archive of this account’s tweets you can clearly see it is indeed a fake. In fact, its very first tweet is “Im Rudy Giuliani mother f*ckers,” as noted by this voat thread. It’s also worth noting that the account was very hostile towards other people on twitter as is displayed by this screenshot of its tweets. You can verify this by visiting this archive.is link of the account’s tweets from September 2016. The only problem is, once again, this is disinformation as the account is not run by Giuliani. It is against Twitter rules to impersonate someone, so this ban is the first in a long string of bans by Twitter that are justified. You can read the full fake statement below, although, it must be said that I agree with Trump’s transition team member Michael Flynn Jr. – who was fired – that Pizzagate is not over until certain questions can be answered, as there are too many coincidences.